A gluten-free diet (GFD) is a diet that strictly excludes gluten, which is a mixture of proteins found in wheat (and all of its species and hybrids, such as spelt, kamut, and triticale), as well as barley, rye, and oats. The inclusion of oats in a gluten-free diet remains controversial, and may depend on the oat cultivar and the frequent cross-contamination with other gluten-containing cereals. Gluten may cause both gastrointestinal and systemic symptoms for those with gluten-related disorders, including coeliac disease (CD), non-coeliac gluten sensitivity (NCGS), gluten ataxia, dermatitis herpetiformis (DH), and wheat allergy. In these people, the gluten-free diet is demonstrated as an effective treatment, but several studies show that about 79% of the people with coeliac disease have an incomplete recovery of the small bowel, despite a strict gluten-free diet. This is mainly caused by inadvertent ingestion of gluten. People with poor basic education and understanding of gluten-free diet often believe that they are strictly following the diet, but are making regular errors. In addition, a gluten-free diet may, in at least some cases, improve gastrointestinal or systemic symptoms in diseases like irritable bowel syndrome, rheumatoid arthritis, multiple sclerosis or HIV enteropathy, among others. Gluten-free diets have also been promoted as an alternative treatment of people with autism, but the current evidence for their efficacy in making any change in the symptoms of autism is limited and weak. Gluten proteins have low nutritional and biological value, and the grains that contain gluten are not essential in the human diet. However, an unbalanced selection of food and an incorrect choice of gluten-free replacement products may lead to nutritional deficiencies. Replacing flour from wheat or other gluten-containing cereals with gluten-free flours in commercial products may lead to a lower intake of important nutrients, such as iron and B vitamins. Some gluten-free commercial replacement products are not enriched or fortified as their gluten-containing counterparts, and often have greater lipid/carbohydrate content. Children especially often over-consume these products, such as snacks and biscuits. Nutritional complications can be prevented by a correct dietary education. A gluten-free diet should be mainly based on naturally gluten-free foods with a good balance of micro and macro nutrients: meat, fish, eggs, milk and dairy products, legumes, nuts, fruits, vegetables, potatoes, rice, and corn are all appropriate components of such a diet. If commercially prepared, gluten-free replacement products are used, choosing those that are enriched or fortified with vitamins and minerals is preferable. Pseudocereals (quinoa, amaranth, and buckwheat) and some minor cereals are healthy alternatives to these prepared products and have high biological and nutritional value. Furthermore, they contain protein of higher nutritional quality than those of wheat, and in greater quantities. One breadcrumb of this size contains enough gluten to reactivate the autoimmune response in people with coeliac disease when they are following a gluten-free diet, although obvious symptoms may not appear. Consuming gluten even in small quantities, which may be the result of inadvertent cross-contamination, impede recovery in people with gluten-related disorders. Coeliac disease (American English: celiac) (CD) is a chronic, immune-mediated, and mainly intestinal process, caused by the ingestion of wheat, barley, rye and derivatives, that appears in genetically predisposed people of all ages. CD is not only a gastrointestinal disease, because it may affect several organs and cause an extensive variety of non-gastrointestinal symptoms, and most importantly, it may often be completely asymptomatic. Added difficulties for diagnosis are the fact that serological markers (anti-tissue transglutaminase [TG2]) are not always present and many people with coeliac may have minor mucosal lesions, without atrophy of the intestinal villi. CD affects approximately 1–2% of the general population all over the world and is on the increase, but most cases remain unrecognized, undiagnosed and untreated, exposing patients to the risk of long-term complications. People may suffer severe disease symptoms and be subjected to extensive investigations for many years before a proper diagnosis is achieved. Untreated CD may cause malabsorption, reduced quality of life, iron deficiency, osteoporosis, obstetric complications (stillbirth, intrauterine growth restriction, preterm birth, low birthweight, and small for gestational age), an increased risk of intestinal lymphomas and greater mortality. CD is associated with some autoimmune diseases, such as diabetes mellitus type 1, thyroiditis, gluten ataxia, psoriasis, vitiligo, autoimmune hepatitis, dermatitis herpetiformis, primary sclerosing cholangitis, and more. CD with "classic symptoms", which include gastrointestinal manifestations such as chronic diarrhoea and abdominal distention, malabsorption, loss of appetite, and impaired growth, is currently the least common presentation form of the disease and affects predominantly to small children generally younger than two years of age. CD with "non-classic symptoms" is the most common clinical type and occurs in older children (over 2 years old), adolescents and adults. It is characterized by milder or even absent gastrointestinal symptoms and a wide spectrum of non-intestinal manifestations that can involve any organ of the body, and very frequently may be completely asymptomatic both in children (at least in 43% of the cases) and adults. Following a lifelong gluten-free diet is the only medically-accepted treatment for people with coeliac disease. Non-coeliac gluten sensitivity (NCGS) is described as a condition of multiple symptoms that improves when switching to a gluten-free diet, after coeliac disease and wheat allergy are excluded. People with NCGS may develop gastrointestinal symptoms, which resemble those of irritable bowel syndrome (IBS) or a variety of nongastrointestinal symptoms. Gastrointestinal symptoms may include any of the following: abdominal pain, bloating, bowel habit abnormalities (either diarrhoea or constipation), nausea, aerophagia, gastroesophageal reflux disease, and aphthous stomatitis. A range of extra-intestinal symptoms, said to be the only manifestation of NCGS in the absence of gastrointestinal symptoms, have been suggested, but remain controversial. These include: headache, migraine, "foggy mind", fatigue, fibromyalgia, joint and muscle pain, leg or arm numbness, tingling of the extremities, dermatitis (eczema or skin rash), atopic disorders such as asthma, rhinitis, other allergies, depression, anxiety, iron-deficiency anemia, folate deficiency or autoimmune diseases. NCGS has also been controversially implicated in some neuropsychiatric disorders, including schizophrenia, eating disorders, autism, peripheral neuropathy, ataxia and attention deficit hyperactivity disorder (ADHD). Above 20% of people with NCGS have IgE-mediated allergy to one or more inhalants, foods or metals, among which most common are mites, graminaceae, parietaria, cat or dog hair, shellfish and nickel. Approximately, 35% of people with NCGS suffer other food intolerances, mainly lactose intolerance. The pathogenesis of NCGS is not yet well understood. For this reasons, it is a controversial syndrome and some authors still question it. There is evidence that not only gliadin (the main cytotoxic antigen of gluten), but also other proteins named ATIs which are present in gluten-containing cereals (wheat, rye, barley, and their derivatives) may have a role in the development of symptoms. ATIs are potent activators of the innate immune system. FODMAPs, especially fructans, are present in small amounts in gluten-containing grains and have been identified as a possible cause of some gastrointestinal symptoms in persons with NCGS. As of 2019, reviews have concluded that although FODMAPs may play a role in NCGS, they only explain certain gastrointestinal symptoms, such as bloating, but not the extra-digestive symptoms that people with NCGS may develop, such as neurological disorders, fibromyalgia, psychological disturbances, and dermatitis. After exclusion of coeliac disease and wheat allergy, the subsequent step for diagnosis and treatment of NCGS is to start a strict gluten-free diet to assess if symptoms improve or resolve completely. This may occur within days to weeks of starting a GFD, but improvement may also be due to a non-specific, placebo response. Recommendations may resemble those for coeliac disease, for the diet to be strict and maintained, with no transgression. The degree of gluten cross contamination tolerated by people with NCGS is not clear but there is some evidence that they can present with symptoms even after consumption of small amounts. It is not yet known whether NCGS is a permanent or a transient condition. A trial of gluten reintroduction to observe any reaction after 1–2 years of strict gluten-free diet might be performed. A subgroup of people with NCGS may not improve by eating commercially available gluten-free products, which are usually rich of preservatives and additives, because chemical additives (such as sulphites, glutamates, nitrates and benzoates) might have a role in evoking functional gastrointestinal symptoms of NCGS. These people may benefit from a diet with a low content of preservatives and additives. NCGS, which is possibly immune-mediated, now appears to be more common than coeliac disease, with prevalence rates between 0.5–13% in the general population. People can also experience adverse effects of wheat as result of a wheat allergy. Gastrointestinal symptoms of wheat allergy are similar to those of coeliac disease and non-coeliac gluten sensitivity, but there is a different interval between exposure to wheat and onset of symptoms. Wheat allergy has a fast onset (from minutes to hours) after the consumption of food containing wheat and could be anaphylaxis. The management of wheat allergy consists of complete withdrawal of any food containing wheat and other gluten-containing cereals. Nevertheless, some people with wheat allergy can tolerate barley, rye or oats. A male with gluten ataxia: previous situation and evolution after 3 months of gluten-free diet. Since the beginning of the 21st century, the gluten-free diet has become the most popular fad diet in the United States and other countries. Clinicians worldwide have been challenged by an increasing number of people who do not have coeliac disease nor wheat allergy, with digestive or extra-digestive symptoms which improved removing wheat/gluten from the diet. Many of these persons began a gluten-free diet on their own, without having been previously evaluated. Another reason that contributed to this trend was the publication of several books that demonize gluten and point to it as a cause of type 2 diabetes, weight gain and obesity, and a broad list of diseases ranging from depression and anxiety to arthritis and autism. The book that has had the most impact is Grain Brain: The Surprising Truth about Wheat, Carbs, and Sugar - Your Brain's Silent Killers, by the American neurologist David Perlmutter, published in September 2013. Another book that has had great impact is Wheat Belly: Lose the Wheat, Lose the Weight, and Find Your Path Back to Health, by the cardiologist William Davis, which refers to wheat as a "chronic poison" and became a New York Times bestseller within a month of publication in 2011. The gluten-free diet has been advocated and followed by many celebrities to lose weight, such as Miley Cyrus, Gwyneth Paltrow, and Kourtney Kardashian, and are used by some professional athletes, who believe the diet can improve energy and health. It became popular in USA, as the popularity of low-carbohydrate diets faded. Estimates suggest that in 2014, 30% of people in USA and Australia were consuming gluten-free foods, with a growing number, calculated from surveys that by 2016 approximately 100 million Americans would consume gluten-free products. Data from a 2015 Nielsen survey of 30,000 adults in 60 countries around the world conclude that 21% of people prefer to buy gluten-free foods, being the highest interest among the younger generations. In USA, it was estimated that more than half of people who buy foods labeled gluten-free do not have a clear reaction to gluten, and they do so "because they think it will help them lose weight, because they seem to feel better or because they mistakenly believe they are sensitive to gluten." Although gluten is highly immunologically reactive and humans appear not to have evolved to digest it well, a gluten-free diet is not a healthier option for the general population, other than people suffering from gluten-related disorders or other associated conditions which improve with a gluten-free diet in some cases, such as irritable bowel syndrome and certain autoimmune and neurological disorders. There is no published experimental evidence to support that the gluten-free diet contributes to weight loss. In a review of May 2015 published in Gastroenterology, Fasano et al. conclude that, although there is an evident "fad component" to the recent rise in popularity of the gluten-free diet, there is also growing and unquestionable evidence of the existence of non-coeliac gluten sensitivity. The popularity of the gluten-free diet is hurting people who actually need to eliminate gluten due to medical reasons. The servers are issuing judgments, believing that it is simply a fad, which is leading to them not taking the necessary precautions in the handling of the food to avoid gluten cross-contamination. "In other words, the customers who 'order gluten-free meals washed down with a gluten-filled beer' are essentially making a mockery of a serious issue". Even many professionals in the medical field think that the gluten-free diet is just a fad. On the other hand, the popularity of the gluten-free diet has increased the availability of commercial gluten-free replacement products and gluten-free grains. Gluten-free commercial replacement products, such as gluten-free cakes, are more expensive than their gluten-containing counterparts, so their purchase adds a financial burden. They are also typically higher in calories, fat, and sugar, and lower in dietary fibre. In less developed countries, wheat can represent an important source of protein, since it is a substantial part of the diet in the form of bread, noodles, bulgur, couscous, and other products. In the British National Health Service gluten free foods have been supplied on prescription. For many patients this meant at no cost. When it was proposed to alter this in 2018 the Department of Health and Social Care made an assessment of the costs and benefits. The potential annual financial saving to the service was estimated at £5.3 million, taking into account the reduction in cost spending and the loss of income from prescription charges. The proposed scenario was actually that patients could still be prescribed gluten free breads and mixes but would have to buy any other gluten free products themselves the savings would only amount to £700,000 a year. Local initiatives by clinical commissioning groups had already reduced the cost of gluten free foods to the NHS by 39% between 2015 and 2017. Healthcare professionals recommend against undertaking a gluten-free diet as a form of self-diagnosis, because tests for coeliac disease are reliable only if the person has been consuming gluten recently. There is a consensus in the medical community that people should consult a physician before going on a gluten-free diet, so that a medical professional can accurately test for coeliac disease or any other gluten-induced health issues. Although popularly used as an alternative treatment for people with autism, there is no good evidence that a gluten-free diet is of benefit in reducing the symptoms of autism. In a 2013 double-blind, placebo-controlled challenge (DBPC) by Biesiekierski et al. in a few people with irritable bowel syndrome, the authors found no difference between gluten or placebo groups and the concept of non-celiac gluten sensitivity as a syndrome was questioned. Nevertheless, this study had design errors and an incorrect selection of participants, and probably the reintroduction of both gluten and whey protein had a nocebo effect similar in all people, and this could have masked the true effect of gluten/wheat reintroduction. In a 2015 double-blind placebo cross-over trial, small amounts of purified wheat gluten triggered gastrointestinal symptoms (such as abdominal bloating and pain) and extra-intestinal manifestations (such as foggy mind, depression and aphthous stomatitis) in self-reported non-celiac gluten sensitivity. Nevertheless, it remains elusive whether these findings specifically implicate gluten or other proteins present in gluten-containing cereals. In a 2018 double-blind, crossover research study on 59 persons on a gluten-free diet with challenges of gluten, fructans or placebo, intestinal symptoms (specifically bloating) were borderline significantly higher after challenge with fructans, in comparison with gluten proteins (P=0.049). Although the differences between the three interventions was very small, the authors concluded that fructans (the specific type of FODMAP found in wheat) are more likely to be the cause of gastrointestinal symptoms of non-celiac gluten sensitivity, rather than gluten. In addition, fructans used in the study were extracted from chicory root, so it remains to be seen whether the wheat fructans produce the same effect. Quinoa is a pseudocereal that is gluten-free. Gluten-free bread made of a mixture of flours like buckwheat flour, tapioca flour, millet flour and psyllium seed husks. Special flour mixes can be bought for bread-making purposes. A gluten-free diet is a diet that strictly excludes gluten, proteins present in wheat (and all wheat varieties such as spelt and kamut), barley, rye, oat, and derivatives of these grains such as malt and triticale, and foods that may include them, or shared transportation or processing facilities with them. The inclusion of oats in a gluten-free diet remains controversial. Oat toxicity in people with gluten-related disorders depends on the oat cultivar consumed because the immunoreactivities of toxic prolamins are different among oat varieties. Furthermore, oats are frequently cross-contaminated with the other gluten-containing cereals. Pure oat (labelled as "pure oat" or "gluten-free oat") refers to oats uncontaminated with any of the other gluten-containing cereals. Some cultivars of pure oat could be a safe part of a gluten-free diet, requiring knowledge of the oat variety used in food products for a gluten-free diet. Nevertheless, the long-term effects of pure oats consumption are still unclear and further studies identifying the cultivars used are needed before making final recommendations on their inclusion in the gluten-free diet. Other grains, although gluten-free in themselves, may contain gluten by cross-contamination with gluten-containing cereals during grain harvesting, transporting, milling, storing, processing, handling or cooking. Processed foods commonly contain gluten as an additive (as emulsifiers, thickeners, gelling agents, fillers, and coatings), so they would need specific labeling. Unexpected sources of gluten are, among others, processed meat, vegetarian meat substitutes, reconstituted seafood, stuffings, butter, seasonings, marinades, dressings, confectionary, candies, and ice cream. Cross contamination in the home is also a consideration for those who suffer gluten-related disorders. There can be many sources of cross contamination, as for example when family members prepare gluten-free and gluten-containing foods on the same surfaces (counter tops, tables, etc.) or share utensils that have not been cleaned after being used to prepare gluten-containing foods (cutting boards, colanders, cutlery, etc. ), kitchen equipment (toaster, cupboards, etc.) or certain packaged foods (butter, peanut butter, etc.). Medications and dietary supplements are made using excipients that may contain gluten. The gluten-free diet includes naturally gluten-free food, such as meat, fish, seafood, eggs, milk and dairy products, nuts, legumes, fruit, vegetables, potatoes, pseudocereals (in particular amaranth, buckwheat, chia seed, quinoa), only certain cereal grains (corn, rice, sorghum), minor cereals (including fonio, Job's tears, millet, teff, called "minor" cereals as they are "less common and are only grown in a few small regions of the world"), some other plant products (arrowroot, mesquite flour, sago, tapioca) and products made from these gluten-free foods. An unbalanced selection of food and an incorrect choice of gluten-free replacement products may lead to nutritional deficiencies. Replacing flour from wheat or other gluten-containing cereals with gluten-free flours in commercial products may lead to a lower intake of important nutrients, such as iron and B vitamins and a higher intake of sugars and saturated fats. Some gluten-free commercial replacement products are not enriched or fortified as their gluten-containing counterparts, and often have greater lipid / carbohydrate content. Children especially often over-consume these products, such as snacks and biscuits. These nutritional complications can be prevented by a correct dietary education. Pseudocereals (quinoa, amaranth, and buckwheat) and some minor cereals are healthy alternatives to these prepared products and have higher biological and nutritional value. Advances towards higher nutrition-content gluten-free bakery products, improved for example in terms of fiber content and glycemic index, have been made by using not exclusively corn starch or other starches to substitute for flour. In this aim, for example the dietary fibre inulin (which acts as a prebiotic) or quinoa or amaranth wholemeal have been as substitute for part of the flour. Such substitution has been found to also yield improved crust and texture of bread. It is recommended that anyone embarking on a gluten-free diet check with a registered dietitian to make sure they are getting the required amount of key nutrients like iron, calcium, fiber, thiamin, riboflavin, niacin and folate. Vitamins often contain gluten as a binding agent. Experts have advised that it is important to always read the content label of any product that is intended to be swallowed. Up to 30% of people with known coeliac disease often continue having or redeveloping symptoms. Also, a lack of symptoms or negative blood antibodies levels are not reliable indicators of intestinal recuperation. Several studies show an incomplete recovery of small bowel despite a strict gluten-free diet, and about 79% of such people have persistent villous atrophy. This lack of recovery is mainly caused by inadvertent exposure to gluten. People with poor basic education and understanding of the gluten-free diet often believe that they are strictly following the diet, but are making regular errors. In addition, some people often deliberately continue eating gluten because of limited availability, inferior taste, higher price, and inadequate labelling of gluten-free products. Poor compliance with the regimen is also influenced by age at diagnosis (adolescents), ignorance of the consequences of the lack of a strict treatment and certain psychological factors. Ongoing gluten intake can cause severe disease complications, such as various types of cancers (both intestinal and extra-intestinal) and osteoporosis. The term gluten-free is generally used to indicate a supposed harmless level of gluten rather than a complete absence. The exact level at which gluten is harmless is uncertain and controversial. A 2008 systematic review tentatively concluded that consumption of less than 10 mg (10 ppm) of gluten per day is unlikely to cause histological abnormalities, although it noted that few reliable studies had been done. Food that has become gluten-free through special processing. Reduced gluten content, food which includes food products with between 20 and 100 ppm of gluten Reduced gluten content is left up to individual nations to more specifically define. The Codex Standard suggests the enzyme-linked Immunoassay (ELISA) R5 Mendez method for indicating the presence of gluten, but allows for other relevant methods, such as DNA. The Codex Standard specifies that the gluten-free claim must appear in the immediate proximity of the name of the product, to ensure visibility. There is no general agreement on the analytical method used to measure gluten in ingredients and food products. The ELISA method was designed to detect w-gliadins, but it suffered from the setback that it lacked sensitivity for barley prolamins. The use of highly sensitive assays is mandatory to certify gluten-free food products. The European Union, World Health Organization, and Codex Alimentarius require reliable measurement of the wheat prolamins, gliadins rather than all-wheat proteins. All food products must be clearly labelled whether they contain gluten or they are gluten-free. Since April 2016, the declaration of the possibility of cross-contamination is mandatory when the product does not intentionally add any allergenic food or its derivatives, but the Good Manufacturing Practices and allergen control measures adopted are not sufficient to prevent the presence of accidental trace amounts. When a product contains the warning of cross-contamination with wheat, rye, barley, oats and their hybridised strains, the warning "contains gluten" is mandatory. The law does not establish a gluten threshold for the declaration of its absence. Health Canada considers that foods containing levels of gluten not exceeding 20 ppm as a result of contamination, meet the health and safety intent of section B.24.018 of the Food and Drug Regulations when a gluten-free claim is made. Any intentionally added gluten, even at low levels must be declared on the packaging and a gluten-free claim would be considered false and misleading. Labels for all food products sold in Canada must clearly identify the presence of gluten if it is present at a level greater than 10 ppm. very low gluten foodstuffs: 20-100ppm gluten. All foods containing gluten as an ingredient must be labelled accordingly as gluten is defined as one of the 14 recognised EU allergens. an ingredient that is derived from a gluten-containing grain, that has been processed to remove gluten but results in the presence of 20 ppm or more gluten in the food. Any food product claiming to be gluten-free and also bearing the term "wheat" in its ingredient list or in a separate "Contains wheat" statement, must also include the language "*the wheat has been processed to allow this food to meet the FDA requirements for gluten-free foods," in close proximity to the ingredient statement. Any food product that inherently does not contain gluten may use a gluten-free label where any unavoidable presence of gluten in the food bearing the claim in its labelling is below 20 ppm gluten. ^ a b c d Biesiekierski JR (2017). "What is gluten?". J Gastroenterol Hepatol (Review). 32 Suppl 1: 78–81. doi:10.1111/jgh.13703. PMID 28244676. 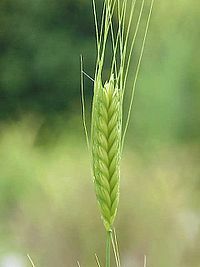 Similar proteins to the gliadin found in wheat exist as secalin in rye, hordein in barley, and avenins in oats and are collectively referred to as “gluten.” Derivatives of these grains such as triticale and malt and other ancient wheat varieties such as spelt and kamut also contain gluten. The gluten found in all of these grains has been identified as the component capable of triggering the immune-mediated disorder, coeliac disease. ^ a b c d Comino I, Moreno Mde L, Sousa C (November 7, 2015). "Role of oats in celiac disease". World J Gastroenterol. 21 (41): 11825–31. doi:10.3748/wjg.v21.i41.11825. PMC 4631980. PMID 26557006. It is necessary to consider that oats include many varieties, containing various amino acid sequences and showing different immunoreactivities associated with toxic prolamins. As a result, several studies have shown that the immunogenicity of oats varies depending on the cultivar consumed. Thus, it is essential to thoroughly study the variety of oats used in a food ingredient before including it in a gluten-free diet. ^ a b c d e f g h i Penagini F, Dilillo D, Meneghin F, Mameli C, Fabiano V, Zuccotti GV (November 18, 2013). "Gluten-free diet in children: an approach to a nutritionally adequate and balanced diet". Nutrients. 5 (11): 4553–65. doi:10.3390/nu5114553. PMC 3847748. PMID 24253052. For CD patients on GFD, the nutritional complications are likely to be caused by the poor nutritional quality of the GFPs mentioned above and by the incorrect alimentary choices of CD patients. (...) the limited choice of food products in the diet of children with CD induces a high consumption of packaged GFPs, such as snacks and biscuits. (..) It has been shown that some commercially available GFPs have a lower content of folates, iron and B vitamins or are not consistently enriched/fortified compared to their gluten containing counterparts. (...) The first step towards a balanced diet starts from early education on CD and GFD, possibly provided by a skilled dietitian and/or by a physician with expert knowledge in CD. (...) It is advisable to prefer consumption of naturally GF foods, since it has been shown that they are more balanced and complete under both the macro- and micro-nutrient point of view. In fact, these foods are considered to have a higher nutritional value in terms of energy provision, lipid composition and vitamin content as opposed to the commercially purified GF products. Within the range of naturally GF foods, it is preferable to consume those rich in iron and folic acid, such as leafy vegetables, legumes, fish and meat. During explanation of naturally GF foods to patients, it is a good approach for healthcare professionals to bear in mind the local food habits and recipes of each country. This may provide tailored dietary advice, improving acceptance and compliance to GFD. Furthermore, increasing awareness on the availability of the local naturally GF foods may help promote their consumption, resulting in a more balanced and economically advantageous diet. Indeed, these aspects should always be addressed during dietary counseling. With regards to the commercially purified GFPs, it is recommended to pay special attention to the labeling and chemical composition. (...) Increasing awareness on the possible nutritional deficiencies associated with GFD may help healthcare professionals and families tackle the issue by starting from early education on GFD and clear dietary advice on how to choose the most appropriate gluten-free foods. ^ a b Hischenhuber C, Crevel R, Jarry B, Mäki M, Moneret-Vautrin DA, Romano A, Troncone R, Ward R (March 1, 2006). "Review article: safe amounts of gluten for patients with wheat allergy or coeliac disease". Aliment Pharmacol Ther. 23 (5): 559–75. doi:10.1111/j.1365-2036.2006.02768.x. PMID 16480395. For both wheat allergy and coeliac disease the dietary avoidance of wheat and other gluten-containing cereals is the only effective treatment. ^ Volta U, Caio G, De Giorgio R, Henriksen C, Skodje G, Lundin KE (June 2015). "Non-celiac gluten sensitivity: a work-in-progress entity in the spectrum of wheat-related disorders". Best Pract Res Clin Gastroenterol. 29 (3): 477–91. doi:10.1016/j.bpg.2015.04.006. PMID 26060112. A recently proposed approach to NCGS diagnosis is an objective improvement of gastrointestinal symptoms and extra-intestinal manifestations assessed through a rating scale before and after GFD. Although a standardized symptom rating scale is not yet applied worldwide, a recent study indicated that a decrease of the global symptom score higher than 50% after GFD can be regarded as confirmatory of NCGS (Table 1) . (…) After the confirmation of NCGS diagnosis, according to the previously mentioned work-up, patients are advized to start with a GFD . ^ a b c d e f g h i j k l See JA, Kaukinen K, Makharia GK, Gibson PR, Murray JA (October 2015). "Practical insights into gluten-free diets". Nat Rev Gastroenterol Hepatol (Review). 12 (10): 580–91. doi:10.1038/nrgastro.2015.156. PMID 26392070. ^ a b Marí-Bauset S, Zazpe I, Mari-Sanchis A, Llopis-González A, Morales-Suárez-Varela M (December 2014). "Evidence of the gluten-free and casein-free diet in autism spectrum disorders: a systematic review". J Child Neurol. 29 (12): 1718–27. doi:10.1177/0883073814531330. hdl:10171/37087. PMID 24789114. ^ a b Buie T (2013). "The relationship of autism and gluten". Clin Ther (Review). 35 (5): 578–83. doi:10.1016/j.clinthera.2013.04.011. PMID 23688532. At this time, the studies attempting to treat symptoms of autism with diet have not been sufficient to support the general institution of a gluten-free or other diet for all children with autism. ...There may be a subgroup of patients who might benefit from a gluten-free diet, but the symptom or testing profile of these candidates remains unclear. ^ a b Millward C, Ferriter M, Calver S, Connell-Jones G (2008). Ferriter M (ed.). "Gluten- and casein-free diets for autistic spectrum disorder". Cochrane Database Syst Rev (2): CD003498. doi:10.1002/14651858.CD003498.pub3. PMC 4164915. PMID 18425890. ^ a b c d e Lamacchia C, Camarca A, Picascia S, Di Luccia A, Gianfrani C (2014). "Cereal-based gluten-free food: how to reconcile nutritional and technological properties of wheat proteins with safety for celiac disease patients". Nutrients (Review). 6 (2): 575–90. doi:10.3390/nu6020575. PMC 3942718. PMID 24481131. ^ a b c Saturni L, Ferretti G, Bacchetti T (January 2010). "The gluten-free diet: safety and nutritional quality". Nutrients (Review). 2 (1): 16–34. doi:10.3390/nu2010016. PMC 3257612. PMID 22253989. . See Table 2 and page 21. ^ a b c Akobeng AK, Thomas AG (June 2008). "Systematic review: tolerable amount of gluten for people with coeliac disease". Aliment. Pharmacol. Ther. 27 (11): 1044–52. doi:10.1111/j.1365-2036.2008.03669.x. PMID 18315587. ^ Moreno ML, Rodríguez-Herrera A, Sousa C, Comino I (2017). "Biomarkers to Monitor Gluten-Free Diet Compliance in Celiac Patients". Nutrients (Review). 9 (1): 46. doi:10.3390/nu9010046. PMC 5295090. PMID 28067823. ^ a b c d e f g h i j k Volta U, Caio G, De Giorgio R, Henriksen C, Skodje G, Lundin KE (June 2015). "Non-celiac gluten sensitivity: a work-in-progress entity in the spectrum of wheat-related disorders". Best Pract Res Clin Gastroenterol. 29 (3): 477–91. doi:10.1016/j.bpg.2015.04.006. PMID 26060112. ^ Hadjivassiliou M, Grünewald RA, Davies-Jones GA (2002). "Gluten sensitivity as a neurological illness". J Neurol Neurosurg Psychiatry (Review). 72 (5): 560–3. PMC 1737870. PMID 11971034. Incomplete elimination of gluten from the diet may be enough to abolish gastrointestinal symptoms with recovery of the small bowel mucosa but is insufficient to arrest the state of heightened immunological responsiveness resulting in neuronal injury. There is a group of patients with CD “resistant” to gluten-free diet. This may reflect hypersensitivity to the minute amounts of gluten present in most “gluten-free” products. ^ a b Francavilla R, Cristofori F, Stella M, Borrelli G, Naspi G, Castellaneta S (October 2014). "Treatment of celiac disease: from gluten-free diet to novel therapies". Minerva Pediatr (Review). 66 (5): 501–16. PMID 24938882. ^ Antiga E, Caproni M (2015). "The diagnosis and treatment of dermatitis herpetiformis". Clin Cosmet Investig Dermatol (Review). 8: 257–65. doi:10.2147/CCID.S69127. PMC 4435051. PMID 25999753. ^ Lionetti E, Gatti S, Pulvirenti A, Catassi C (June 2015). "Celiac disease from a global perspective". Best Pract Res Clin Gastroenterol (Review). 29 (3): 365–79. doi:10.1016/j.bpg.2015.05.004. PMID 26060103. ^ a b c Elli L, Branchi F, Tomba C, Villalta D, Norsa L, Ferretti F, Roncoroni L, Bardella MT (June 2015). "Diagnosis of gluten related disorders: Celiac disease, wheat allergy and non-celiac gluten sensitivity". World J Gastroenterol. 21 (23): 7110–9. doi:10.3748/wjg.v21.i23.7110. PMC 4476872. PMID 26109797. ^ a b c d Ludvigsson JF, Card T, Ciclitira PJ, Swift GL, Nasr I, Sanders DS, Ciacci C (April 2015). "Support for patients with celiac disease: A literature review". United European Gastroenterol J (Review). 3 (2): 146–59. doi:10.1177/2050640614562599. PMC 4406900. PMID 25922674. ^ Saccone G, Berghella V, Sarno L, Maruotti GM, Cetin I, Greco L, Khashan AS, McCarthy F, Martinelli D, Fortunato F, Martinelli P (October 9, 2015). "Celiac disease and obstetric complications: a systematic review and metaanalysis". Am J Obstet Gynecol. 214 (15): 01194–1. doi:10.1016/j.ajog.2015.09.080. PMID 26432464. ^ a b c Lebwohl B, Ludvigsson JF, Green PH (October 2015). "Celiac disease and non-celiac gluten sensitivity". BMJ (Review). 351: h4347. doi:10.1136/bmj.h4347. PMC 4596973. PMID 26438584. ^ Mooney, P; Aziz, I; Sanders, D (2013). "Non-celiac gluten sensitivity: clinical relevance and recommendations for future research". Neurogastroenterology & Motility. 25 (11): 864–871. doi:10.1111/nmo.12216. PMID 23937528. ^ Nijeboer, P; Bontkes, H; Mulder, C; Bouma, G (2013). "Non-celiac gluten sensitivity. Is it in the gluten or the grain?". Journal of Gastrointestinal and Liver Disorders. 22 (4): 435–40. PMID 24369326. ^ Catassi C, Bai JC, Bonaz B, Bouma G, Calabrò A, Carroccio A, Castillejo G, Ciacci C, Cristofori F, Dolinsek J, Francavilla R, Elli L, Green P, Holtmeier W, Koehler P, Koletzko S, Meinhold C, Sanders D, Schumann M, Schuppan D, Ullrich R, Vécsei A, Volta U, Zevallos V, Sapone A, Fasano A (September 2013). "Non-Celiac Gluten sensitivity: the new frontier of gluten related disorders". Nutrients. 5 (10): 3839–53. doi:10.3390/nu5103839. PMC 3820047. PMID 24077239. ^ a b c d e f g h i j Fasano A, Sapone A, Zevallos V, Schuppan D (May 2015). "Nonceliac gluten sensitivity". Gastroenterology (Review). 148 (6): 1195–204. doi:10.1053/j.gastro.2014.12.049. PMID 25583468. ^ a b c d e f Catassi C, Bai J, Bonaz B, Bouma G, Calabrò A, Carroccio A, Castillejo G, Ciacci C, Cristofori F, Dolinsek J, Francavilla R, Elli L, Green P, Holtmeier W, Koehler P, Koletzko S, Meinhold C, Sanders D, Schumann M, Schuppan D, Ullrich R, Vécsei A, Volta U, Zevallos V, Sapone A, Fasano A (2013). "Non-celiac gluten sensitivity: the new frontier of gluten related disorders". Nutrients (Review). 5 (10): 3839–3853. doi:10.3390/nu5103839. ISSN 2072-6643. PMC 3820047. PMID 24077239. ^ a b c d e f g Aziz I, Hadjivassiliou M, Sanders DS (September 2015). "The spectrum of noncoeliac gluten sensitivity". Nat Rev Gastroenterol Hepatol (Review). 12 (9): 516–26. doi:10.1038/nrgastro.2015.107. PMID 26122473. ^ Rossi A, Di Lollo AC, Guzzo MP, Giacomelli C, Atzeni F, Bazzichi L, Di Franco M (2015). "Fibromyalgia and nutrition: what news?". Clin Exp Rheumatol (Review). 33 (1 Suppl 88): S117–25. PMID 25786053. ^ a b Vriezinga SL, Schweizer JJ, Koning F, Mearin ML (September 2015). "Coeliac disease and gluten-related disorders in childhood". Nat Rev Gastroenterol Hepatol (Review). 12 (9): 527–36. doi:10.1038/nrgastro.2015.98. PMID 26100369. ^ Fasano A, Sapone A, Zevallos V, Schuppan D (May 2015). "Nonceliac gluten sensitivity". Gastroenterology (Review). 148 (6): 1195–204. doi:10.1053/j.gastro.2014.12.049. PMID 25583468. One of the most controversial and highly debated discussions concerns the role of gluten in causing NCGS. Recent reports have indicated that gluten might not be the cause of NCGS, and some investigators still question whether NCGS as a real clinical entity. (...) Cereals such as wheat and rye, when consumed in normal quantities, are only minor sources of FODMAPs in the daily diet (Table 1). Therefore, gluten-containing grains are not likely to induce IBS exclusively via FODMAPs. In contrast, there is growing evidence that other proteins that are unique to gluten-containing cereals can elicit an innate immune response that leads to NCGS, raising a nomenclature issue. For this reason, wheat sensitivity, rather than gluten sensitivity, seems to be a more appropriate term, keeping in mind that other gluten-containing grains such as barley and rye also can trigger the symptoms. ^ a b c d e Verbeke, K (February 2018). "Nonceliac Gluten Sensitivity: What Is the Culprit?". Gastroenterology. 154 (3): 471–473. doi:10.1053/j.gastro.2018.01.013. PMID 29337156. Although intolerance to fructans and other FODMAPs may contribute to NCGS, they may only explain gastrointestinal symptoms and not the extraintestinal symptoms observed in NCGS patients, such as neurologic dysfunction, psychological disturbances, fibromyalgia, and skin rash.15 Therefore, it is unlikely that they are the sole cause of NCGS. ^ a b Volta U, Caio G, Tovoli F, De Giorgio R (2013). "Non-celiac gluten sensitivity: questions still to be answered despite increasing awareness". Cellular and Molecular Immunology (Review). 10 (5): 383–392. doi:10.1038/cmi.2013.28. ISSN 1672-7681. PMC 4003198. PMID 23934026. ^ Mansueto, Pasquale; Seidita, Aurelio; D'Alcamo, Alberto; Carroccio, Antonio (2014). "Non-Celiac Gluten Sensitivity: Literature Review". Journal of the American College of Nutrition (Review). 33 (1): 39–54. doi:10.1080/07315724.2014.869996. hdl:10447/90208. ISSN 0731-5724. PMID 24533607. ^ Genuis SJ, Lobo RA (2014). "Gluten Sensitivity Presenting as a Neuropsychiatric Disorder". Gastroenterology Research and Practice (Review). 2014: 1–6. doi:10.1155/2014/293206. ISSN 1687-6121. PMC 3944951. PMID 24693281. ^ Molina-Infante J, Santolaria S, Sanders DS, Fernández-Bañares F (May 2015). "Systematic review: noncoeliac gluten sensitivity". Aliment Pharmacol Ther (Review). 41 (9): 807–20. doi:10.1111/apt.13155. PMID 25753138. ^ a b Scherf KA, Brockow K, Biedermann T, Koehler P, Wieser H (September 18, 2015). "Wheat-Dependent Exercise-Induced Anaphylaxis". Clin Exp Allergy [Epub ahead of print]. 46 (1): 10–20. doi:10.1111/cea.12640. PMID 26381478. Wheat-dependent exercise-induced anaphylaxis (WDEIA) is a rare, but potentially severe food allergy exclusively occurring when wheat ingestion is accompanied by augmenting cofactors. (...) The most reliable prophylaxis of WDEIA is a gluten-free diet. In less severe cases, a strict limitation of wheat ingestion before exercise and avoidance of other cofactors may be sufficient. ^ Pietzak M (January 2012). "Celiac disease, wheat allergy, and gluten sensitivity: when gluten free is not a fad". JPEN J Parenter Enteral Nutr. 36 (1 Suppl): 68S–75S. doi:10.1177/0148607111426276. PMID 22237879. ^ Volta U, Caio G, Karunaratne TB, Alaedini A, De Giorgio R (2017). "Non-coeliac gluten/wheat sensitivity: advances in knowledge and relevant questions". Expert Rev Gastroenterol Hepatol (Review). 11 (1): 9–18. doi:10.1080/17474124.2017.1260003. PMID 27852116. ^ Lebwohl B, Ludvigsson JF, Green PH (October 2015). "Celiac disease and non-celiac gluten sensitivity". BMJ (Review). 5: 351:h4347. doi:10.1136/bmj.h4347. PMC 4596973. PMID 26438584. ^ a b c Nash DT, Slutzky AR (2014). "Gluten sensitivity: new epidemic or new myth?". Proc (Bayl Univ Med Cent). 27 (4): 377–8. PMC 4255872. PMID 25484517. ^ Shewry PR, Hey SJ (2016). "Do we need to worry about eating wheat?". Nutr Bull. 41 (1): 6–13. doi:10.1111/nbu.12186. PMC 4760426. PMID 26941586. ^ Lebwohl B, Ludvigsson JF, Green PH (October 2015). "Celiac disease and non-celiac gluten sensitivity". BMJ (Review). 351: h4347. doi:10.1136/bmj.h4347. PMC 4596973. PMID 26438584. Some population groups seem to be especially wed to the gluten-free diet, with nearly 50% of 910 athletes (including world class and Olympic medalists) adhering to a gluten-free diet, mainly because of the perceived health and energy benefits. ^ Jones AL (2017). "The Gluten-Free Diet: Fad or Necessity?". Diabetes Spectr. 30 (2): 118–123. doi:10.2337/ds16-0022. PMC 5439366. PMID 28588378. ^ "Is gluten-free a lifestyle or a diet craze?". USA Today. March 5, 2013. Retrieved April 4, 2018. ^ "Celebrities Who Are Gluten-Free". InStyle. ^ a b Dubner, Stephen J. (October 18, 2017). "The Demonization of Gluten - Freakonomics". Freakonomics. Archived from the original on October 19, 2017. Retrieved November 6, 2017. ^ "An increasing number of Australians are choosing a gluten-free diet". Herald Sun. November 18, 2014. Retrieved April 4, 2018. ^ Reilly NR (2016). "The Gluten-Free Diet: Recognizing Fact, Fiction, and Fad". J Pediatr. 175: 206–10. doi:10.1016/j.jpeds.2016.04.014. PMID 27185419. ^ "Gluten-free diet fad: Are celiac disease rates actually rising?". CBS News. July 31, 2012. Retrieved December 6, 2013. ^ a b Pietzak M (2012). "Celiac disease, wheat allergy, and gluten sensitivity: when gluten free is not a fad". JPEN J Parenter Enteral Nutr. 36 (1 Suppl): 68S–75S. doi:10.1177/0148607111426276. PMID 22237879. ^ a b c Gaesser GA, Angadi SS (2012). "Gluten-free diet: imprudent dietary advice for the general population?". J Acad Nutr Diet. 112 (9): 1330–3. doi:10.1016/j.jand.2012.06.009. PMID 22939437. ^ "The Consequences of a Gluten-Free Diet Craze". National Wheat Foundation. Retrieved April 6, 2018. ^ Shewry P.R. "Seed Proteins". In: Black M., Bewley J.D., editors. Seed Technology and Its Biological Basis. Sheffield Academic Press; Sheffield, UK: 2000. pp. 42–84. ^ "Ending gluten-free prescribing entirely would have more health benefits and save more money, government assessment finds". Pharmaceutical Journal. November 8, 2018. Retrieved December 16, 2018. ^ Lewis, Shannon. "Three Reasons to Go Gluten Free and Three Reasons Not to". Related Forms & Information. Province Health & Services. Retrieved March 30, 2014. ^ Elli L, Branchi F, Tomba C, Villalta D, Norsa L, Ferretti F, Roncoroni L, Bardella MT (June 21, 2015). "Diagnosis of gluten related disorders: Celiac disease, wheat allergy and non-celiac gluten sensitivity". World J Gastroenterol (Review). 21 (23): 7110–9. doi:10.3748/wjg.v21.i23.7110. PMC 4476872. PMID 26109797. ^ Haboubi NY, Taylor S, Jones S (October 2006). "Coeliac disease and oats: a systematic review". Postgrad Med J (Review). 82 (972): 672–8. doi:10.1136/pgmj.2006.045443. PMC 2653911. PMID 17068278. ^ "Guidelines to Prevent Cross-Contamination of Gluten-free Foods" (PDF). Food Safety Authority of Ireland. Archived from the original (PDF) on March 5, 2016. Retrieved December 20, 2015. ^ Comino I, Moreno Mde L, Real A, Rodríguez-Herrera A, Barro F, Sousa C (October 23, 2013). "The gluten-free diet: testing alternative cereals tolerated by celiac patients". Nutrients. 5 (10): 4250–68. doi:10.3390/nu5104250. PMC 3820072. PMID 24152755. ^ Cruz, JE; Cocchio, C; Lai, PT; Hermes-DeSantis, E (January 1, 2015). "Gluten content of medications". American Journal of Health-System Pharmacy. 72 (1): 54–60. doi:10.2146/ajhp140153. PMID 25511839. ^ O'Brian T, Ford R, Kupper C, Celiac Disease and Non-Celiac Gluten Sensitivity: The evolving spectrum, pp. 305–330. In: Ingrid Kohlstadt (December 10, 2012). Advancing Medicine with Food and Nutrients, Second Edition. CRC Press. p. 318. ISBN 978-1-4398-8774-5. ^ a b FLETCHER RF, McCRIRICK MY (1958). "Gluten-free diets". British Medical Journal. 2 (5091): 299–301. doi:10.1136/bmj.2.5091.299. PMC 2026255. PMID 13560852. ^ Gibson GR, Roberfroid MB (1995). "Dietary modulation of the human colonic microbiota: introducing the concept of prebiotics". The Journal of Nutrition (Review). 125 (6): 1401–12. doi:10.1093/jn/125.6.1401. PMID 7782892. ^ Gallagher E, Gormley TR, Arendt EK (2004). "Recent advances in the formulation of gluten-free cereal-based products". Trends in Food Science & Technology. 15 (3–4): 143–152. doi:10.1016/j.tifs.2003.09.012. ISSN 0924-2244. ^ "Gluten-free Diet". Retrieved December 11, 2016. ^ a b c Rostom A, Murray JA, Kagnoff MF (December 2006). "American Gastroenterological Association (AGA) Institute technical review on the diagnosis and management of celiac disease". Gastroenterology (Review). 131 (6): 1981–2002. doi:10.1053/j.gastro.2006.10.004. PMID 17087937. ^ "Codex Standard For "Gluten-Free Foods" CODEX STAN 118-1981" (PDF). Codex Alimentarius. February 22, 2006. ^ Hischenhuber C, Crevel R, Jarry B, Makai M, Moneret-Vautrin DA, Romano A, Troncone R, Ward R (March 1, 2006). "Review article: safe amounts of gluten for patients with wheat allergy or coeliac disease". Aliment Pharmacol Ther. 23 (5): 559–75. doi:10.1111/j.1365-2036.2006.02768.x. PMID 16480395. ^ Poms, R. E.; Klein, C. L.; Anklam, E. (2004). "Methods for allergen analysis in food: A review". Food Additives and Contaminants. 21 (1): 1–31. doi:10.1080/02652030310001620423. PMID 14744677. ^ "FINAL ASSESSMENT REPORT PROPOSAL P264 REVIEW OF GLUTEN CLAIMS WITH SPECIFIC REFERENCE TO OATS AND MALT". Australian Government. Retrieved August 9, 2014. ^ "SUBMISSION FROM COELIAC AUSTRALIA". ^ a b "Rotulagem de alimentos Alergênicos". Agência Nacional de Vigilância Sanitária (ANVISA). June 7, 2017. Retrieved April 7, 2018. ^ "Agência Nacional de Vigilância Sanitária Guia sobre Programa de Controle de Alergênicos". Agência Nacional de Vigilância Sanitária (ANVISA). 2016. Retrieved April 7, 2018. ^ "Health Canada's Position on Gluten-Free Claims". Health Canada. December 2010. Retrieved August 9, 2014. ^ "Gluten-free food". Directorate-General for Health and Consumers. Retrieved July 25, 2015. ^ "EU Food Information for Consumers Regulation (EU FIC)" (link). Food Standards Agency. March 2016. ^ Roe, Sam. "Children at risk in food roulette". Chicagotribune.com. Retrieved September 20, 2009. ^ Roe, Sam. "Whole Foods pulls 'gluten-free' products from shelves after Tribune story". Chicagotribune.com. Retrieved September 20, 2009. Look up Gluten-Free in Wiktionary, the free dictionary. This page was last edited on 27 March 2019, at 20:19 (UTC).